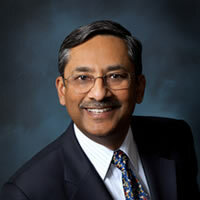 Over the last twenty years, Padmanabhan Srinagesh (“Nagesh”) has held senior positions in litigation consulting and telecommunications research. During this period, he’s written several expert reports for antitrust and regulatory agencies analyzing proposed mergers (mainly in telecommunications) and telecommunications regulations. Additionally, he’s been a testifying expert in cases involving the telecommunications and payments industries. Dr. Srinagesh has extensive experience as a consulting expert in antitrust litigation and patent infringement cases, and also worked on breach of contract cases. For antitrust cases, he’s analyzed liability in alleged tying, predatory pricing, and exclusionary conduct, and calculated damages resulting from these actions. For patent infringement cases, he’s assessed damages using both the lost profits and the reasonable royalty frameworks. Before he began his career in litigation consulting, Dr. Srinagesh was a senior economist at Bellcore. Prior to that, he was on the faculties of Williams College and the University of Illinois at Chicago, where he taught economics.